In my craniosacral therapy-related work, I learned to work on TMJ/jaw issues. It didn’t take long to realize that distress in the jaw joint is accompanied by distress in the neck. With the intent of providing even more relief, I studied Tom Myers’ DVD course, Easing the Neck, and after practicing it, began using it. My recipients loved this neck work, even when they didn’t have TMJ issues or forward head posture, so I incorporated these myofascial release techniques into a new offering, my Back Shoulder Neck Head sessions, into which I added trigger point work, lymphatic drainage, and range-of-motion testing. I was excited about adding this to my repertoire. Clients loved it, and I was getting great results. When I learned that a woman I knew was suffering from neck pain, I offered her a session, and that’s where the learning started. This client has given me permission to share this story on my blog. I see the image on my intake form where she circled (heavily) the neck, especially on the left side, an area on the left medial scapula, and circled more lightly the top of the head, arms, and feet. I worked on her neck as I had worked on others. I noted that I found trigger points and released them on her sternocleidomastoids, anterior scalenes, and upper trapezius, so maybe it helped, but when she got off the table, she was still in pain. She was gracious about it, but I could tell she felt disappointed. Sometimes being on the healing path (and the healer’s path) means making mistakes. You encounter your ignorance, get motivated, and learn discernment in the process. You do better next time. I hate to disappoint a client coming in for help. I felt small and ineffective. I mentally filed this very important idea: “Sometimes [neck] issues may not be what you think.” I knew I needed to know more. Working with/on the body can sometimes be so straightforward and other times be such a mystery. She had a lot of support through this on Facebook, and she posted maybe a month later that she had been diagnosed as having a herniated disk in her neck. Her suffering got pretty bad, but she was able to get treatment and I presume is doing a lot better now. I recently studied orthopedic massage at the Lauterstein-Conway Massage School with Jan Hutchinson, physical therapist of 40 years. One of the attractions was learning how to identify and work on (if appropriate) specific injuries like this. I want to share what I learned, because I believe this is an easy mistake for massage therapists to make, and getting an accurate diagnosis early can prevent pain and suffering. And it may give all readers an idea of what orthopedic massage is all about. In the history of a client with neck pain, the client with a herniated disk may complain of tingling, numbness, or sharp pain in the neck or upper extremity. It is often unilateral but can be bilateral. Certain positions and movements may relieve or aggravate symptoms. Bed rest decreases pain. In terms of observation, there are no visible signs of a herniated disc, although the forward head posture may accompany a herniated disc. The therapist will be unable to palpate the herniated disk because of the vertebral structure, but particular movements and significant pressure may contribute to symptoms. Active or passive range of motion may aggravate symptoms. There is no significant pain with manual resistive testing. Orthopedic massage can include special tests to help the therapist identify the specific tissues involved in the client’s pain and dysfunction, to make treatment most effective. The Spurling test has the client seated with her head in a neutral position. The therapist, standing behind her, presses straight downward, starting with gentle pressure and progressively increasing pressure. If symptoms are aggravated, the test is positive for nerve compression. The therapist can also test with the head laterally flexed to the affected side and in partial extension and rotation to affected side. 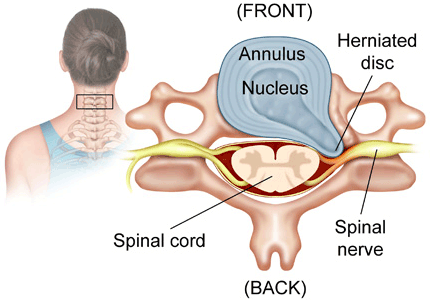 This test decreases the space between the vertebrae and presses on the nerve root exiting the spine. The cervical distraction test has the client seated with her head in a neutral position. The practitioner places her hands under the occiput and on the forehead and applies a moderate lifting force to the head and neck. If the client gets relief from her symptoms, it indicates nerve compression. Symptoms return when the practitioner removes her hands. The slump test has the client seated on the table with hands clasped behind the back. The client slumps forward, fully flexing the head and neck, while extending the leg on the affected side and dorsiflexing the foot. If the client feels symptoms in the upper extremity, the test is positive for nerve compression. In terms of treatment, determining the precise location and degree of herniation requires a diagnostic evaluation with an MRI. If a massage client has the history, symptoms, and positive tests as presented above, massage therapists should refer them to a doctor. The good news for those with a herniated disk is that surgery is not as frequently recommended now as it once was. Some disk herniations heal spontaneously, and rehabilitative exercises can encourage the disk to move back into its proper position, relieving pressure on nerve roots. In particular, the McKenzie method, a type of self-treatment taught by some physical therapists, is recommended. Massage is not contraindicated but should be used cautiously. Massage can help decrease muscle tension and may reduce compressive loading on the disk. What would I do now if a client came in with her symptoms? If the pain was not severe, I would listen carefully to a description of the pain and where it is located, have them show me their neck range of motion, and ask what makes it better and worse, in particular looking for whether it feels better when the client lies down. I would have the client sit and first traction their head up (the cervical distraction test) to see if it gives them any relief. I would also press down gently (the Spurling test) to see if it recreated symptoms. If these tests were positive for herniated disk, I would refer the client a doctor for a medical diagnosis. I would treat them for neck tension, being careful not to compress the cervical vertebrae. I would also warn them that since lying down gives relief, do not be alarmed if the pain returns when they stand after the massage. I personally would not work on anyone whose neck pain was severe unless they had a medical diagnosis and were being treated by a PT or doing self-treatment. My source is the book Orthopedic Assessment in Massage Therapy by Whitney Lowe and my class notes from Jan Hutchinson, PT/LMT. So there you have it. If this helps you understand what orthopedic massage is about, good. Particularly if it helps you distinguish myofascial neck pain from a herniated cervical disk, then going public with my previous ignorance makes it worthwhile. This entry was posted in heart and tagged Back Shoulder Neck Head, case study, cervical distraction test, herniated cervical disc, HOPRRS method, intake form, massaging the neck, myofascial neck pain, orthopedic massage, referring massage clients to a doctor, slump test, Spurling test by MaryAnn Reynolds. Bookmark the permalink. Great blog! I have tingling down my right arm for a year now that alleviates or gets worse depending on how I position my head. I want to get a session with you to evaluate this to see if its a disc or bone spur or something.